For thousands of years the Orkney Isles have been seen by mariners as a great place to stock up with provisions before or after a great sailing expedition. In modern times the safe harbours offered by Orkney were the last stopping point for ships heading out across the Atlantic to the New World and beyond. Today this tradition continues with cruise liners frequently stopping in the waters just off Kirkwall and Stromness. Orkney is now Scotland’s favourite cruise destination and third most popular in the United Kingdom. According to a survey conducted in 2008 cruise ships boost Orkney’s economy by more than £2.8 million a year. These ships deliver more than 30,000 passengers and 10,000 crew in to the local shops, restaurants and historic sites. This accounts for around 25% of Orkney’s total annual visitors. The average spend per passenger on shore was £49, with 94% of total passenger numbers coming ashore either to tour or shop. Around 70 ships visit the islands every year. The survey was commissioned by the Orkney Islands Council’s Director of Harbours, following a generic report by the same agency on European Cruise Ship ports and their economic comparative data. 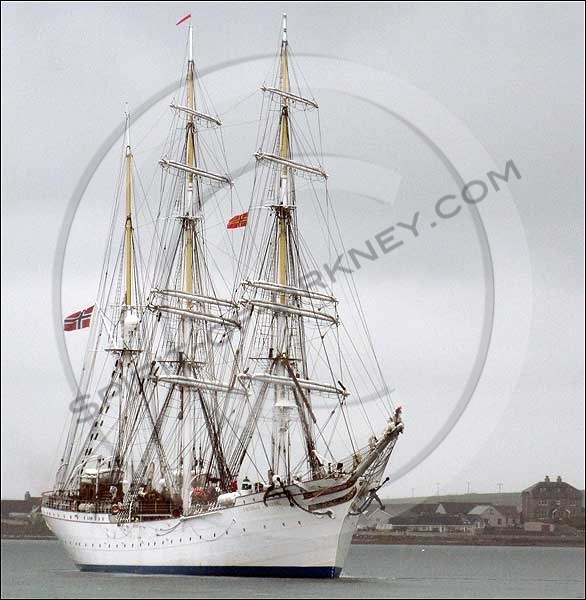 Statsraad Lehmkuhl – a three-masted barque rigged sail training vessel owned and operated by the Statsraad Lehmkuhl Foundation. Orkney is one of 12 harbours around Scotland to be selected as a guest harbour to play host to Tall Ships during The Tall Ships Races in July 2011. Both Greenock and Lerwick are official host ports within the race series, and plans are taking shape to encourage Tall Ships to visit to Scottish Guest Harbours during the cruise in company leg between Greenock and Lerwick from July 12-21. Shetland is taking the lead to develop the nine day sail between these ports, a non-competitive leg of the Races series. Cruise Scotland website – Breathtaking scenery, stunning cities, haunting history, UNESCO World Heritage sites, and a variety of ports large and small make Scotland the perfect cruise destination. Orkney Marine Services – Marine Services provides all pilot launch and pilotage services directly as well as Vessel Traffic Services for Scapa Flow and approaches and the Kirkwall Harbour area.